23.7.1917: Launched by Cochrane & Sons Ltd, Selby (Yd.No.816) (“Mersey” class) for The Admiralty as GEORGE ANDREW (Ad.No.3556). 29.10.1917: Completed as a minesweeper (1 – 12pdr HA and W/T). 1921: Sold to Pickering & Haldane’s Steam Trawling Co Ltd, Hull (John McCann & Edward Cartwright, managers). 19.7.1921: Registered at Hull (H194). 13.9.1921: Registered at Hull as LORD ASTOR (H194). 7.2.1929: Sold to W. B. Willey & Sons Ltd, Hull (William B Willey Junr, manager). 5.7.1929: Registered at Hull as COTSWOLD (H194). 30.4.1936: Sailed Hull for Faroes grounds on last trip before sale (Sk. J. Blackshaw). 15.5.1936: At Hull landed 391 kits grossed £510. 5.1936: Sold to Boston Deep Sea Fishing & Ice Co Ltd, Fleetwood (Basil A. Parkes, manager). 4.1.1940: Escorted HM Submarine H.34 from Dundee to Rosyth. 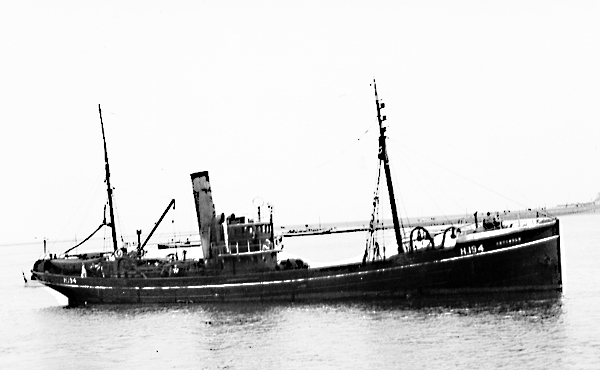 6.1945: Sold to Grimsby Motor Trawlers Ltd, Grimsby. 7.1945: Registered at Grimsby as COTSWOLD (GY77). 1.1946: Returned to owner as COTSWOLD (GY77). 5.1946: Completed Special Survey at Troon. 6.6.1946: Sold to A. J. Tilbrook Ltd, Milford Haven. 10.1948: Sold to Yolland Brothers Ltd, Milford Haven (John Yolland, manager). 8.1954: Sold to B. J. Nijkerk SA, Antwerp for breaking up. 11.8.1954: Sailed Milford for Belgium. 23/01/2009: Page published. 3 updates since then. 16/02/2018: Removed FMHT watermark from image. This entry was posted in Steam Trawlers, Steamers (Picture) and tagged Boston DSF & I, Mersey Class, Parkes on January 23, 2009 by Fred Smith.